Karen Mullarkey is a WBFF Pro who shares her expertise through personal training, fitness consulting and fitness modeling. Whether you would like personal training, consulting advice in regards to anything fitness or advice on how to get started in the fitness modeling industry Karen can help you. Karen has since retired from competing so she can focus on building her personal training business “No Mullarkey” Personal training and her High End Consulting business. Karen trains and consults with clients all around the globe and continues to build her fitness empire. She works with pro golfers (one of which just won her very first pro tournament in Australia, Cheyenne Woods), recreational skiers and snowboarders, national figure, bikini and physique competitors and the everyday individual looking to live a healthy and balanced lifestyle. Karen will not only travel the world with elite pro athletes such as golf pro’s on competitive tours, but she also will travel to Aspen, Vail, and other winter sports meccas for specialized training and program design. Please contact Karen directly for more personalized information. Karen’s philosophy is much more unique than many fitness enthusiasts out there. Karen knows how to balance life and fitness. If you follow her on social media you find her showing fitness tips on the slopes flying down the mountain on her snowboard, shooting tips on her boat “No Mullarkey” while wake boarding and water skiing and of course in the gym itself. She has a contagious personality combined with a sweet southern accent which will grow on you. Her passion for fitness comes out in everything she does as she leads by example. You will even find her challenging some poor soul to a push-up contest in the middle of a music festival, Mullarkey knows how to have fun with fitness! You might also recognize Karen because she is a cover model and has been published in almost every major national fitness publication. An ISSA certified personal trainer, she was just in an a national campaign ad for ISSA. She not only is a very skilled athlete and isn’t afraid to sweat but she also knows her angles when in front of the camera. She has also been aired nationally on television in a commercial for fitness equipment. She is a writer and role model and continues to get published internationally when she puts her pen to paper. Look for Karen to continue changing fitness with her unique philosophies. Combined with the experience, knowledge and know how this gal is going to change fitness for the better. She is a firm believer in living life to it’s fullest because life is just too darn short. As she would say…….”YEEHAW BABY”! Remember…….”No Excuses and that’s No Mullarkey”! Where are you from and have you always been into fitness? I was born and raised in the great city of Louisville, KY. I was always involved in athletics and grew up with a very competitive drive. I began playing field hockey in high school and decided to pursue an athletic scholarship to college in that sport. I ended up signing on with Kent State University to play division one field hockey my senior year of high school. Earning that scholarship was one of the proudest moments of my life. Attending Kent State and playing division one field hockey was truly a memorable experience. It was a time for me to grow not only as an athlete, but as a student and an independent young woman. After four years, I ended up graduating with a BA in Geography. How did you become a fitness competitor? Following college, I was lost without having a sport to compete in. I moved from Ohio to a small town in Colorado and took up snowboarding and backpacking. I absolutely love the outdoors and Colorado was a huge playground for me. I could not afford to join the gym in Colorado so my weight training was put on hold. I guess it was a small price to pay for being a snow bum! I tried my best to make a living in the small mountain town of Salida, CO but I was forced to move to a larger city to begin a career, which is why I ended up in Scottsdale, AZ. I joined a gym and picked up where I had left off with weight training. It was in July of 2004 that I decided to compete in my very 1st figure competition. Little did I know that my life and physique were about to change. Tell us about your fitness competition experience. In November of 2004, I competed in my first NPC competition in Phoenix, AZ. I had never even seen a bodybuilding and figure competition, so I was viewing it for the first time from the stage! I ended up placing 3rd in my class and knew that I had found a new sport to compete in. I did one more local NPC show in 2005 and then competed at the USA’s. I ended up placing 5th in my class at my very first National show, it was then and there that I realized I wanted to earn my pro card. That dream became a reality when I became an IFBB Figure Pro at the 2007 Figure Nationals in New York. What a year 2007 was…I became an IFBB Figure Pro, quit my day job and decided to start my own personal training business appropriately named “No Mullarkey” Personal Training. In 2011, you crossed over as a Pro from the IFBB to the WBFF. What is the WBFF and why did you join it? WBFF stands for World Bodybuilding and Fitness Federation and they are based in Canada. I decided to make the switch for a couple of reasons. First, I competed in the IFBB for three consecutive years but had little improvements with my placing. I felt that at each competition I brought the best package I could bring to the stage so I do not have any regrets with my efforts in the IFBB. It was an absolute honor to compete with some of the best physiques from around the world, but it was time for a change. Second, my focus has changed from competing to modeling and writing. I truly enjoy the challenge of staying in shape year round for photo shoots. I also love being creative at shoots and figuring out how to get the images published. One of the creative ways for me to get published was to get back in touch with my love for writing. I figured I am blogging about fitness so why not turn those blogs into articles and get them published? I am now a contributing writer for several publications around the world from the United States to the Middle East! 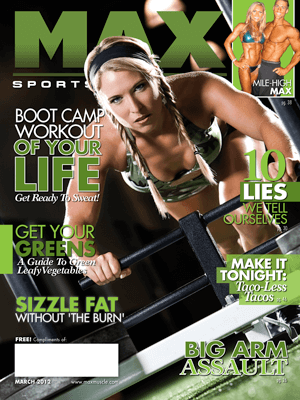 Who would have thought a Kentucky gal would be writing for fitness publications around the world? I made my WBFF debut in August of 2011 at the World’s Championship in Ontario, Canada, while battling a stress fracture to my right foot. Changing my training was quit the learning experience, but I leaned out just fine for the show considering having a sesamoid fracture. I competed in my final competition back in August of 2013 at the WBFF World’s in Las Vegas. After a ten year run, retirement is what this gal needed:) I am now off to doing bigger and better things…….YEEHAW! What do you do when you are not training, modeling, or consulting in the fitness world? I am an avid lover of the outdoors, so I try and spend as much time as I can outside. Since I am such an active person, I love trying to get my cardio in outdoors by trail running. The time flies for me when I am on the trail and I get such an amazing workout. Plus I get to take my german shepherd, Frank the Tank, with me for his daily exercise. He is such a great running partner. Since I reside in Arizona, wintertime is when I hit the trails. I am also a huge fan of snowboarding. I learned about 15 years ago when I lived in Colorado. Once I learned, I was hooked! There is nothing better than making turns on a sunny powder day. If I could snowboard everyday, I would. It is not only great exercise, but is also a wonderful activity you can do during the winter. I don’t mind the snow as long as I can play in it! I am also a boat owner and love getting relief from a hot summer day in Arizona by getting out on the water. I love getting a break from the gym and getting my workout on the water. I am an avid water skier, wake boarder and knee boarder. I also love taking my clients out on “No Mullarkey” so they can get their workouts in on the water. It is my way of showing how much I appreciate their hard work and to thank them for believing in their coach. Karen Mullarkey has been involved in the fitness industry for more than 10 years as a competitive pro athlete, ISSA certified personal trainer, fitness consultant, internationally published writer and cover model. You might recognize Karen because she has been published in every major national fitness publication over the course of her career. She also is not only a fitness cover model but also landed her first novel cover! If you are into fitness you have seen Karen either in the publications, on the book stands or on television. Karen is available for fitness modeling, swimwear modeling, sports modeling, general lifestyle modeling and acting. To book Karen and for all media inquires contact inquiries@karenmullarkey.com. Karen is also represented by Sports + Lifestyle Unlimited nationally and Dani’s Agency locally in Arizona. Check out some of Karen’s satisfied clients here! February-VIP Guest Speaker at the Arnold Classic. Visit arnoldsportsfestival.com. July- National Ad Campaign Model for the ISSA featured in….